Now Coming to the recipe of the day…. Talking about my favorite food always make me happy :-)Turnips….well strangely I love these a lot…along with bitter gourds, bottle gourds, Apple gourds and did I mentioned turnips??? Lol….I just cant resist buying these vegetables and generally cook these in the regular manner, without even bothering to check any other recipes to cook these….Sometimes I love so much, sticking to my roots, rather than to hop from one recipe to another. Though that is not the case with other vegetables….I hunt for different style of cooking of potatoes, capsicum, mushrooms etc, every time I am about to prepare a dish with these. So generally (or for surely) turnips at our home are just made in two ways…..either turnip pickle or Chithyal Ghogrunh ( Mashed Turnips ). I somehow do not feel the need to cook it in any other way, since I love this traditional home style cooked turnip curry, with bags of flavors coming from turnips, fresh garlic, onion and tomatoes…no overpowering spices…..simple, no fuss Sindhi recipe ! 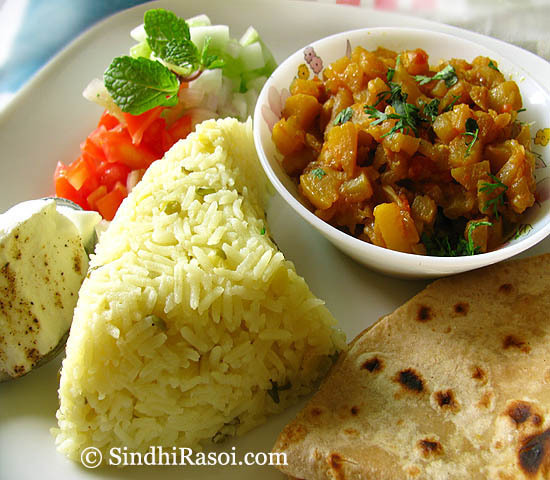 Mashed Turnips curry,a famous Sindhi style of cooking turnips to make a healthy and delicious Subzi ! Ginger a bite size piece, crushed well. Rinse well, peel and chop turnips into small pieces (The way you coarsely chop onions , not very fine ). Peel and chop onions and fresh garlic. In case you do not have fresh garlic, just use crushed cloves of regular garlic (around 5 cloves) . Now in a pressure cooker, take 1 tbsp of oil and saute onions till light brown. Do not let onion turn too dark. Add chopped tomato,crushed ginger, green chillies and salt and stir fry for few seconds. Add chopped turnips, fresh garlic (or dried one, which ever is available), coriander powder and turmeric powder and give it a good mix. Saute it for some time, till the mixture starts sticking at the base of cooker, sprinkle some drops of water and Bhuno again, for some time. Add about half a cup of water and mix well. Close the lid of pressure cooker and wait till pressure of cooker is released for 2-3 times (2-3 whistles). Lower the flame to the lowest heat, and let it cook for couple of minutes. Later, check the consistency of the dish, as it is supposed to be semi dry (Check the picture).Put it back on the flame if there is still any water remaining. Just mash it lightly it a back of spoon till a mushy mix is obtained. You can sprinkle some garam masala powder, but I like the taste, just without any such spice. This is generally eaten with Jowar (sorghum)Doda (Unleavened flat bread or jolada roti or Bhakri ) along with Lassi or chaach (buttermilk) Or else with soft Khichdi rice cooked with handful of Dal like unhulled split moong dal or urad dal,with some salt and turmeric powder.Enjoy! I bought turnip today and saw this recipe.Coming from Sailu’s kitchen. 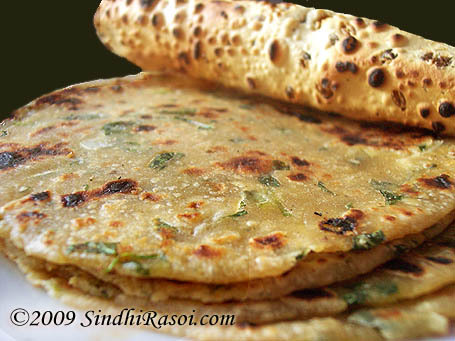 Your Sindhi thali looked great.Have never tried any sindhi food. Will def try now. turnips as easily available here in UK and been thinking how to make it taste it good.. alka your recipe is up next in kitchen…. Looks so so yumm wouldloe with roties.